Even if the UK wasn’t a nation soaked in booze from head to toe, eating out in London as a teetotaller isn’t always easy. While plenty of people also abstain from the bottle, many more drink like it’s going out of fashion and want to know about the sauce that a restaurant offers – details I can’t provide unless my dining companion likes a tipple. The feeling that my work on this site is only half-finished, no matter how many times I eat at a restaurant, is a nagging one always at the back of my mind. That nagging feeling raised its ugly head at Bright, the restaurant spin-off of P Franco – the Clapton wine bar feted for both its booze and its food by the capital’s quasi-hipster twentysomething novelty seekers. Then again, if a professional critic for one of the nationals can crank out a review of a barbecue restaurant despite being largely vegan, then I can sure as hell review a wine bar without getting blotto. Although definitely a restaurant, Bright’s wine bar heritage is plain to see. You can prop up the bar and just have a drink, grazing if you so desire, choosing from a wine list that’s several times longer than the food menu. Or you can a grab a table and scoff three courses, although that’s currently easier said than done. 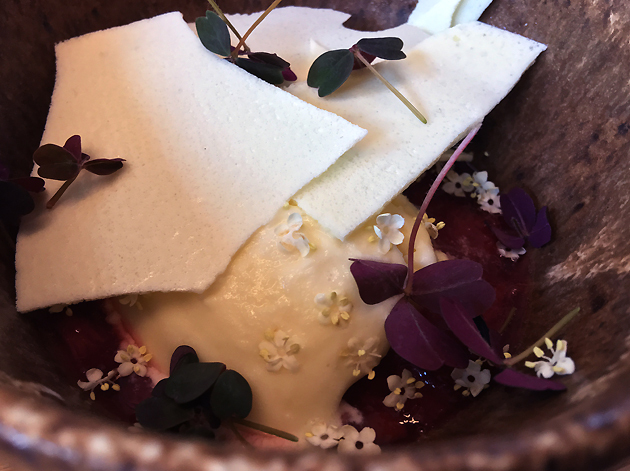 Given the buzzy word of mouth surrounding Bright’s eclectic, continent-hopping, antipodean-ish menu (which changes frequently), reservations are a must. If first impressions were everything, then I would start and finish this review with the grilled red prawns. The scarlet crustaceans were delightfully fragrant, their musk lingering on my fingers long after the discarded shells had been taken away. 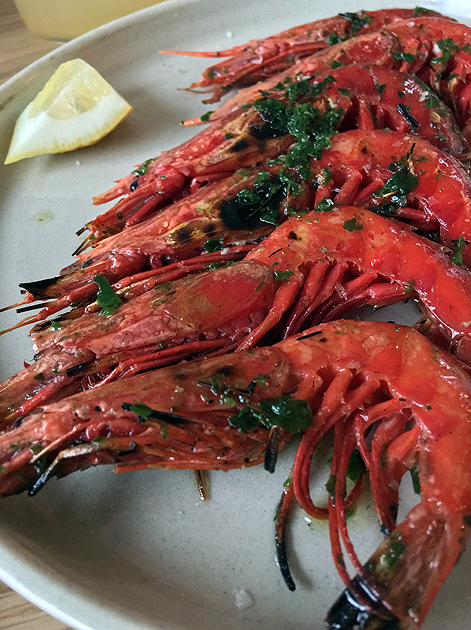 Although the distinctive sweetness and quivering texture of these prawns had been somewhat blunted by being grilled rather than served raw, there was still enough to both leave a smile on my face. 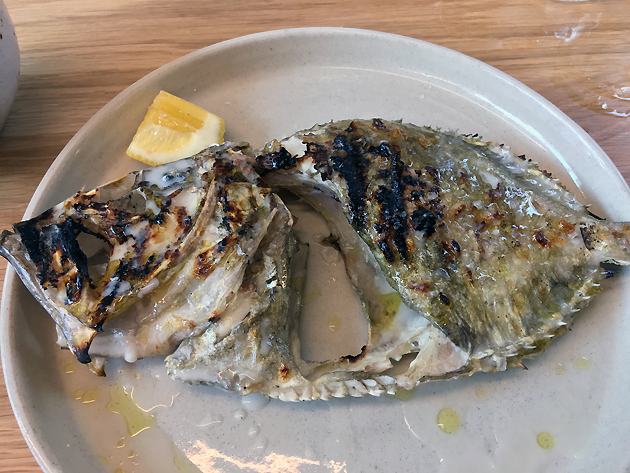 The grilling had imparted a powerful smokiness that was especially apparent in the musky head gunk – slurping every last drop should be compulsory. Slurping every last drop of head gunk. The Freudian slips just keep coming. 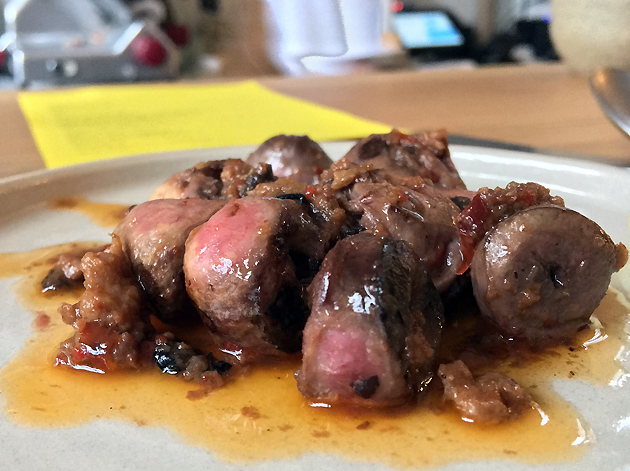 Grilled duck hearts inevitably draws comparisons with Japanese-style yakitori. Although these bite-sized bits of offal didn’t quite have the crisp bouncy texture of the very best yakitori, they certainly weren’t duds. Akin to plump, chewy mushrooms, they were especially winsome when take with the meaty, lightly spiced XO sauce, heavy with umami. 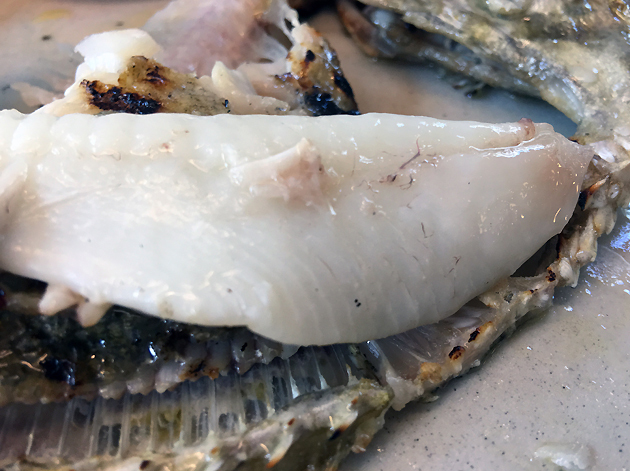 The gurnard may not look like much at first glance, but the light yet meaty fillet of fish was glossier and more pearlescent than a Hollywood starlet’s dentures. It was the perfect conveyor for the lightly umami sauce – apparently made from a stock of fish guts and bones – dotted with sweet, fragrant basil. Stop gurning for the camera. 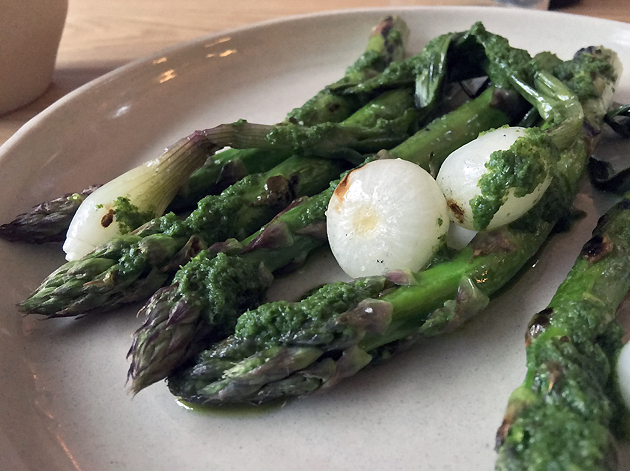 Pleasingly firm spears of asparagus had a smoky nuttiness and would’ve been more than good enough on their own. They were even better when dunked in an unctously eggy and creamy Hollandaise-like sauce or taken with the gently sweet and yieldingly soft onions. 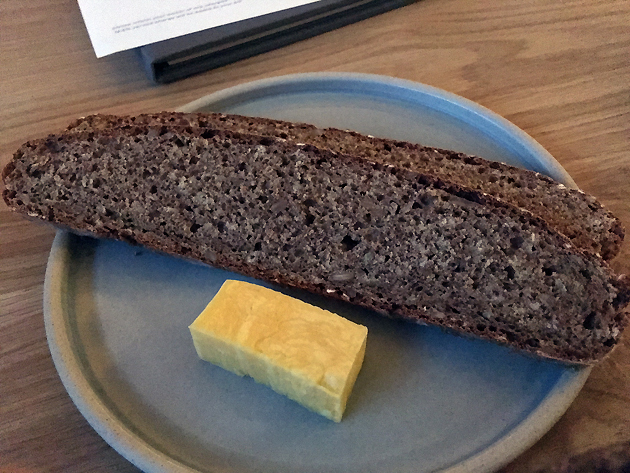 It was a shame that this splendid first meal had to end on a sour note – quite literally. 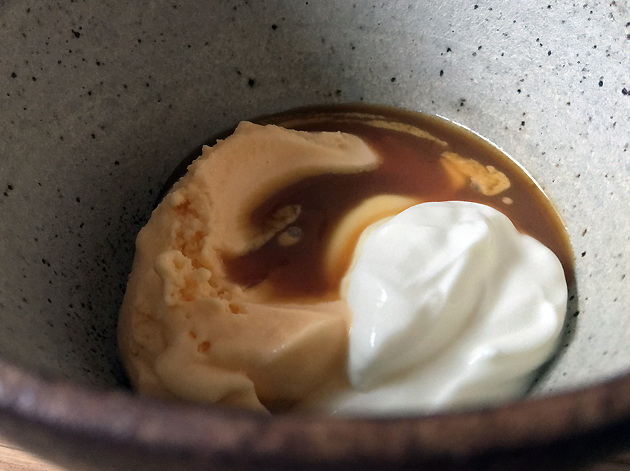 The bulk of the ‘caramel, iced milk’ was a swede-coloured ice cream that was a bit too airy with crunchy ice crystals, but not nearly enough flavour to make up for the deficient mouthfeel. The unexpectedly sour edge to the caramel was unsettlingly odd and deeply unpleasant. The milky sour cream was the least disappointing element of this dessert. For a restaurant that only sometimes has a single charcuterie option on offer, Bright nonetheless has a dedicated slicer visible from the bar – a mammoth industrial-looking contraption of the type more often found in Italian eateries. 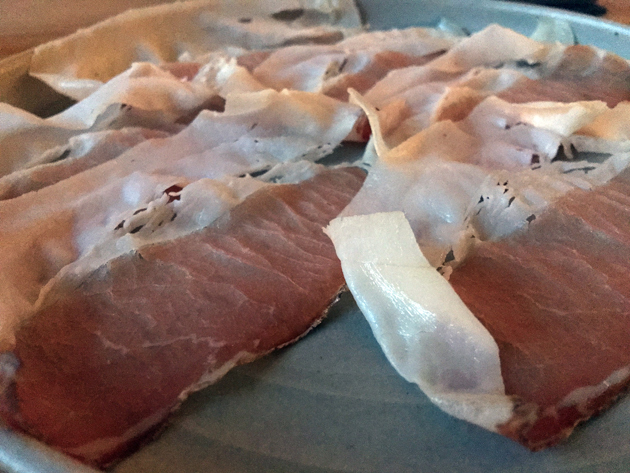 Although the pale pink meat of the cured pork loin was a tad too tough on this occasion, the luscious silky soft reams of fat more than made up for it – combining unctuousness and saltiness often makes up for a multitude of sins. The neighbouring Mare Street Market is an odd place. And not necessarily in a good way. 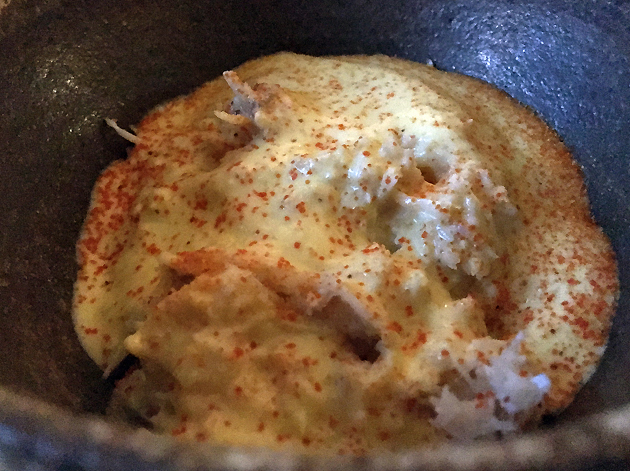 The star of the crab salad wasn’t the uninspired head meat or the creamy hollandaise-ish concoction mixed into it. It was instead the bed of pickled carrots, their tartness interspersed with a flavour reminiscent of mandarin orange – an unexpectedly brilliant, mould-breaking combination of sweet and sour. That last caption was a bit crabby, but I regret nothing. The slices of soda bread accompanying the crab salad deserve some laudatory words of their own – hearty yet light with an addictive malty flavour. This was neatly enhanced by the salted, whippy butter. When taken together, they produced an almost comte-like effect of salty crunch, lactic tang and nutty savouriness. It was just too good to sully with the so-so creamed crab or even the otherwise splendid pickled carrots. Off-kilter photo captions are part of this site’s bread and butter, after all. 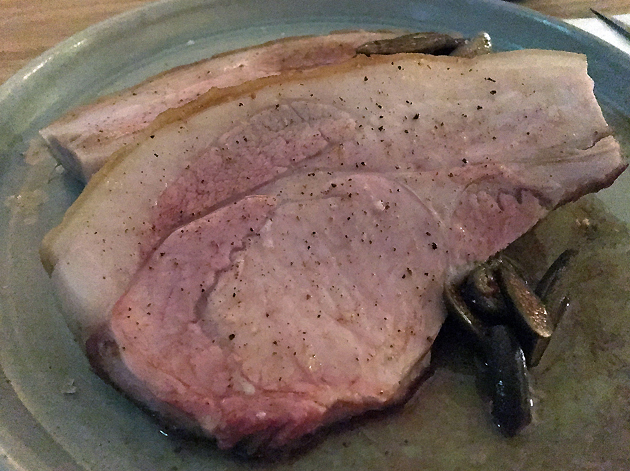 Although the pork chops were, somewhat inevitably, not a patch on the swine flesh available at Pitt Cue, their milkiness and tender bite still made for fine eating. The two-chop portion was almost too generous – thankfully, their relative heaviness was somewhat offset by punchy capers both scattered on top and served on the side along with crisp radishes. I can’t believe I’m complaining about getting too much meat in my mouth. What is the world coming to. 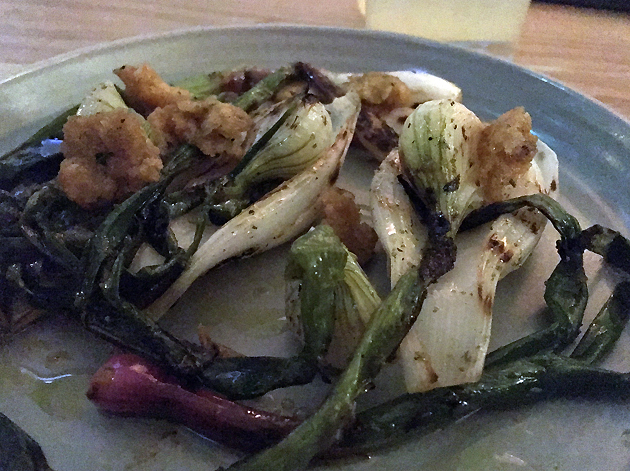 The sweet and soft onions that accompanied the asparagus from my first meal made a repeat appearance, this time accompanied by another type of onion – more taut and slippery, tinged with bitterness. This complimentary one-two onion punch came topped with dense, hearty and crunchy croutons of deep-fried bread that were good enough to grace any panzanella, never mind a humble dish of onions. There are a handful of outdoor tables in the event of good weather. No jokes about the British summer, please – those are too tired and lazy, even for these captions. 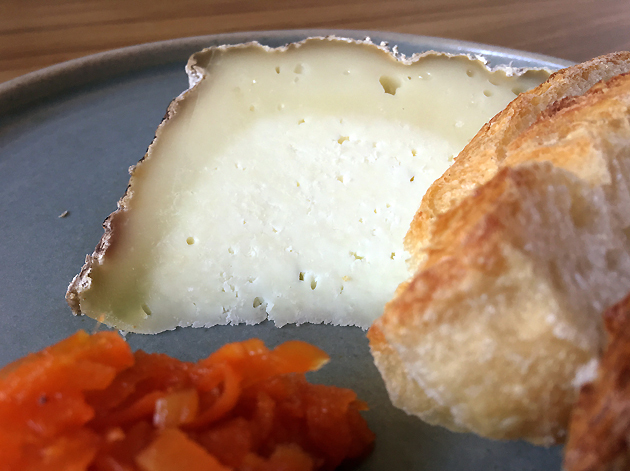 Coolea had a nutty saltiness reminiscent of aged gouda or gruyere, qualities enhanced by the crunchy hazelnuts and an unexpected drizzle of sweet, floral honey. Without it, this cheese would only have been half as enjoyable. Modest in volume and judiciously applied, the honey was nonetheless a wonder. If there was one thing that I didn’t expect to find at Bright, it was a pork tonkatsu almost worthy of the name. Most tonkatsu in London is barely worth mentioning in the same breath as the delightful cutlets available in Japan. This made Bright’s sandwich rendition even more of an unexpected pleasure. The crisp, crunchy and oil-free batter gave way to reveal meaty, moist chunks of lightly sweet pork neatly enhanced by a peppery mustard on the side. The only thing missing was the moist, fatty layer of unctuousness between batter and meat. 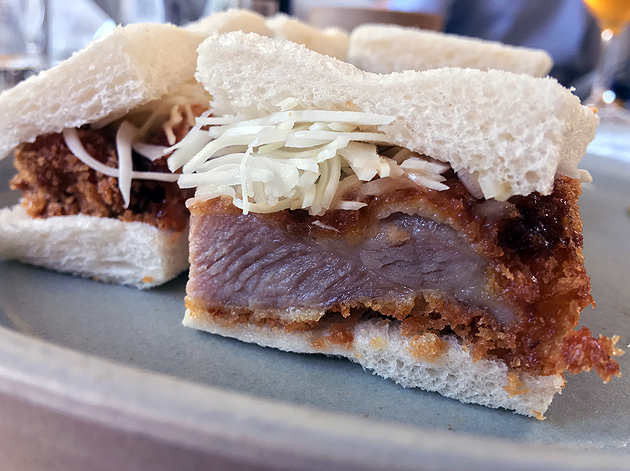 Even without it though, this pork tonkatsu sarnie was still a joy from beginning to end. The white bread didn’t get in the way of the battered cutlet pieces. 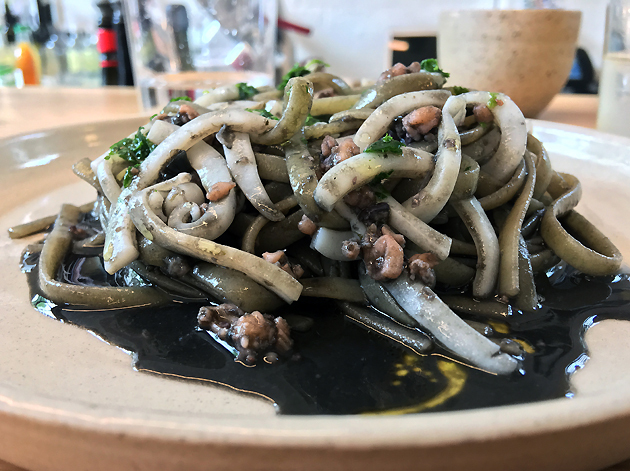 Bright unexpectedly has a section of its menu dedicated to pasta, but its mezze mancini unsurprisingly couldn’t compare to the carby offerings of a dedicated pasta restaurant such as Lina Stores. 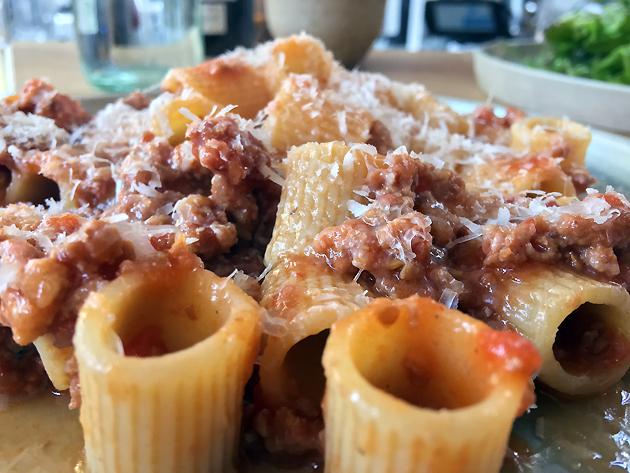 The rigatoni-like pasta coils were a tad too soft with not enough mouthfeel. The sausage meat ragu was similarly limp, with not nearly enough herby umami meatiness. Even the grating of parmesan failed to make much of an impression. This is one of those genteel, laid-back wine bars where some customers bring their kids. Who turn out to be surprisingly well-behaved. 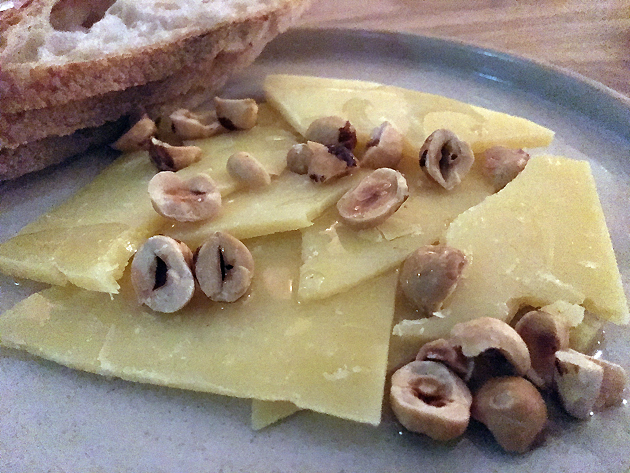 The slice of pecorino had a softer-than-expected bite for a hard cheese, but that was no bad thing. The quivering, yieldingly soft texture aptly complimented the musky earthiness and light sweetness of this cheese. Those flavours were easily overwhelmed by the spiced pickled carrots and bread though. I once ate so much cheese in one sitting that the passage of time became meaningless and I could feel every follicle of my hair growing. Cuttlefish linguine saw the squid-like critters sliced into long, thin strips, similar to the strands of pasta. It was an apt combination, the springy firmness of one neatly transitioning into the other. The umami of the inky sauce not only bound the two highly complimentary textures together, but ensured this dish had the flavour to match its adeptly executed mouthfeel. Although the John Dory was a bit too small for my liking, that was the only flaw in this otherwise superlative fish dish. The glossy, ivory fillets of flesh peeled away from the bone with ease, packing a potent smoky zestiness that was as intensely flavoursome as it was unexpected. 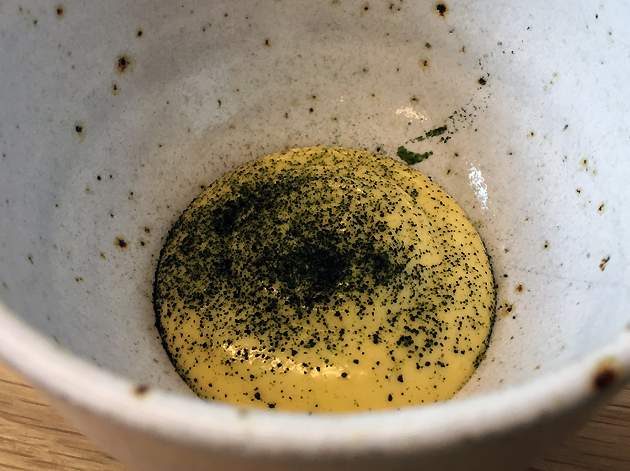 That smoky zestiness was bolstered further by the punchiness of the smoked oyster cream on the side, akin to a Cantonese-style oyster sauce but with the creaminess of hollandaise and a surprisingly clean aftertaste. 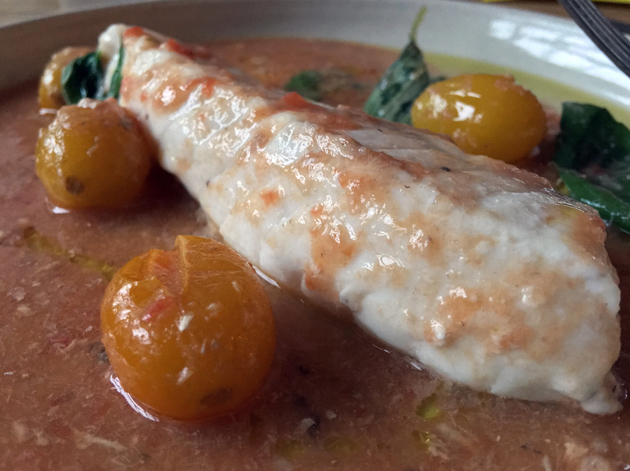 It’s a far cry from the stodgy, uninviting and bland fish dishes of my childhood. I mistyped ‘smoky zestiness’ as ‘zmoky’. ‘Zmoky’ should definitely be a thing. The ‘elderflower milk’ ice cream didn’t taste of much, but it was notably smoother than Bright’s previous attempt at an ice cream. It was refreshing too, helped along by its clean aftertaste. The crisp meringue-like pieces of white chocolate was a neat textural counterpoint that didn’t involve the usual biscuit wafers. Although taut and squidgy, the pieces of rhubarb lying underneath were too sweet for my liking – I would’ve preferred a much tarter taste. 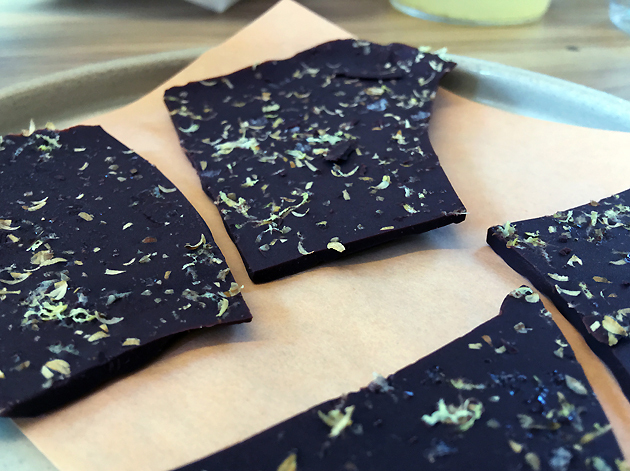 Smooth and bittersweet pieces of dark chocolate had a hint of saltiness and a fruity undertone. I would never have guessed that the latter was due to the presence of coriander seed. If Bright was the traditional fine dining restaurant it’s successfully pretending not to be, then this would be the petit fours. And a very fine petit fours it is too. To say that Bright’s kitchen has a talent for seafood is an understatement akin to saying that the Antarctic is a bit nippy in winter. Although the kitchen is a bit more wobbly when it comes to red meat and noticeably more unsure of itself when it comes to desserts, their way with fish and shellfish underpromises and overdelivers to delightful effect. Bright’s airy, minimalist decor helps you forget that this restaurant is located in what appears to be an annexe to the neighbouring 60s-era office block, an unabashedly ugly building from the outside. It’s the service that really seals the deal, though. Although speed and efficiency can take a hit when the restaurant is full to the rafters, the winsomely handsome front of house crew nonetheless welcomed everyone warmly and had an unflappable chirpy friendliness that could pacify rioters and tame rabid animals. Bethnal Green may have lost Paradise Garage, with the Typing Room soon to follow, but Bright’s back-to-basics approach should hopefully ensure it has more staying power than its somewhat more extravagant forebears. I certainly hope it does – London needs more restaurants like Bright, a shining example of skilful cooking and affable service. Dining Hours: Wednesday – Friday 18.00-22.30. Saturday – Sunday noon-15.00 and 18.00-22.30. Closed Monday and Tuesday. Average cost for one person including soft drinks and service charge: £65-75 approx. Tags: asparagus, bread, bright, butter, charcuterie, cheese, chocolate, crab, cuttlefish, fish, hearts, ice cream, john dory, london, offal, onions, p franco, pasta, pickles, pork, prawns, restaurant, review, rhubarb, salad, sandwich, tonkatsu, yakitori. Bookmark the permalink.